Stack On Clear See Through Drawers Large Drawer Stops Prevent Spills 14.5" x 6" x 18.5" 37.8cm x.. 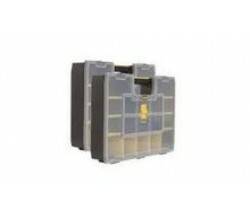 The pro-organiser has 8 deep compartments and a polycarbonate super clear lid to lock them all in pl.. The Stanley 197483 has 512 different configurations, the Stanley 'Sortmaster' organiser can be custo..
Twin pack of Stanley Sortmaster organisers which provide storage flexibility. Each organiser has 10 ..